6.36 points at 22 votes (rank 551). What is gone, is gone! 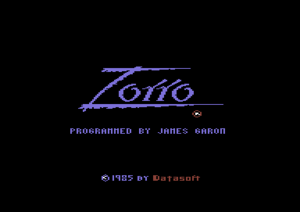 Zorro offers everything that you connect with this name: a kidnapped Senorita, an evil warloard, many half-intelligent canon or rapier fodder, suppressed Mexican farmers and an impregnable fortress. 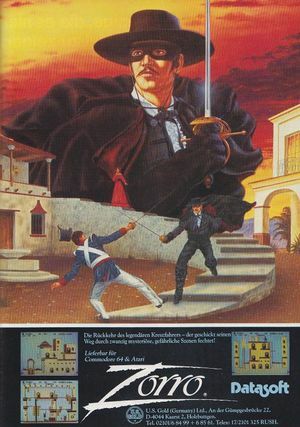 Already at the start of the game, a noble Senorita is kidnapped by Sergeant Garcia, however, not without dropping her handkerchief beforehand. Zorro's primary task will be to bring back her blowrag and along the way, free her from the claws of the evil warloard. 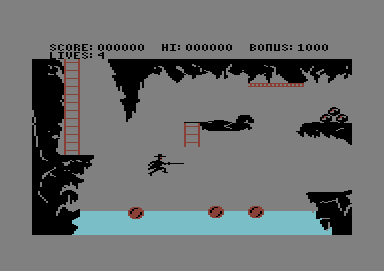 Concerning the game principle and graphics, Zorro shows highly visible parallels to The Goonies and Bruce Lee, but here it is expanded by a rather funnily staged "paper chase". To get into the enemy's fortress you need three artefacts: the "Chalice of Honour", the "Horseshoe of Luck" and the "Boot of Briskness". To get all these items, Zorro needs to get other itmes and then combine correctly. For example, Zorro must give a bottle of rum to a barman, which he then drinks empty, whereupon he sinks down drunk on the counter. From now on you can use the stomach of this thirsty guy as a trampoline. Our disguised avenger can only carry one item at a time. The artefacts, the Senorita's handkerchief and the gold sacks do not count. If Zorro is forced to draw his rapier, he will drop the item that he carries with him at that point of time. 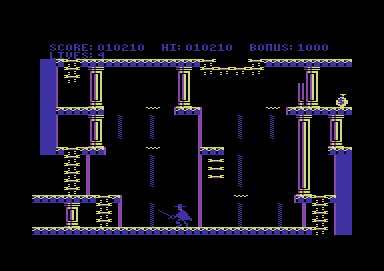 Similar to Conan or The Goonies Datasoft decided to use only a fistful of colours from the impressive palette of the C64. This, however, has - in contrast to the previously named games - a certain atmospheric effect. If you enter the catacombs below the town, the colours change, but not the number. You should also notice that Zorro's complexion changes, depending on wether he runs or jumps. The background music is short and is repeated permanently. It does not attract negative attention at the beginning, but soon it gnaws at the player's psyche. You yearn for the moment when you put the second bell into the steeple, or respectively enter the catacombs. Only then you get rid of the tootling. Alternatively, you can press the key "S", then you will also hear sound effects, which you will be denied while the tootling is active. 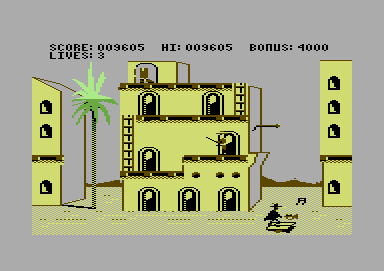 Obviously, was not only the colour palette, but also the impressive number of sound canals unknown to the developer. If Zorro encounters an enemy, he automatically draws his rapier and drops his item - if he carries one. The fencing happens more or less automatically. If you press the joystick into the direction of the enemy you will push him away. When both rapiers point downwards you have to press the fire button and Zorro has already won. Zorro is just about to play a love song to his beloved Senorita and then she is kidnapped by his arch-enemy, Sergeant Garcia! 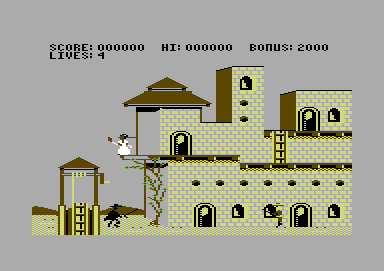 The fiend abducts her into his fort "La Carcel", where he probably wants to force her into a marriage! Zorro as hero can of course not let this happen and runs for her rescue. But the fort is hermetically sealed. Tricky acts are needed, if Zorro wants to free his beloved from Garcia's hands. Artefacts, duels with Garcia's henchmen, puzzles and a strange hotel, in which items appear again and again, expect you. You see how your beloved is kidnapped, but do not make the effort to follow Garcia. Even if you have only little shortfall, the drawbridge will close down in your face. Instead, climb up the flower twine and jump so that you can get the handkerchief. Then you climb down the ladder into the well. Arrived at the bottom, you need to jump on the first ball in the lake. This lake is one of the meanest locations in the game, so beware! On the ball you take a swing, jump to the right and hold onto the ladder. Layway at the grating over the third ball and let go to drop down. The upper path is unfortunately blocked with cannon balls at the moment. With a swing you should now land a the lower exit which brings you into the old cellar. Well, do you see the Chalice of Honour? Are you tempted? However, now you cannot reach the Chalice of Honour yet, because at the left there is a wall and the dividing wall to the right can only be moved up with a mechanism. You need a counterweight. Jog the ball at the upper left. It rolls onto the first lift, this goes down and the second up. Then the ball rolls onto the second, which then lies still at the bottom. You alone have not enough weight to get the first lift to the very bottom. You have to get heavier. Let yourself fall through the hole at the lower left to reach another section of the cellar. Again at the top, place the potted plant on the first lift and then enter it yourself. The combined weight is enough, so that the ball at the very top tolls further onto the third lift and the separating wall goes up. There is no more that you can do at the moment, so head back! Getting back is even more difficult! Jump on the third ball and keep as little swing as possible before you jump on the second. 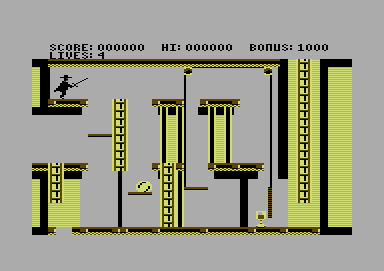 Then jump with swing on the ladder and from the top on the first ball, from which you reach the ledge. Climb up. Go right to the bar. There you can see the descent that leads to the Chalice of Honour. However, a heavy box blocks the way. A mechanism could lift it, but you need a counterweight at the chandelier. 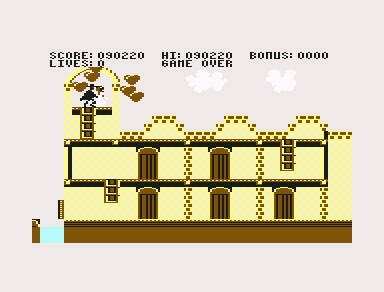 For now go on until you pass a springboard and reach the "Olé o" hotel. Grab the key and jump on the sofa to reach the ledge on the right. Then leave the hotel and climb the church until you have reached the still empty holes for the bells. Jump again, unlock the door and jump once more. Now you can bag a bottle of high percentage rum. With this finding you go back to the bar. In no case show the rum to the guests! Instead give it to the waiter who can be found at the righmost part of the counter. He will get drunk and then sleep, so his stomach can be used as a trampoline with which you can reach the upper floor. Now you need a counterweight for the chandelier, because you cannot work as one. Wait at the top until a soldier comes out of the door at the left and push him back in the duel until he falls down and grabs hold of the chandelier. It will pull the box upwards. Now climb down the ladder. At the bottom you can finally get hold of the Chalice of Honour, so that this problem is now solved. At the top again, you go to the spring board, climb up the palm and use the upper left exit to reach the stables. Here you can already see the next object of desire: the Horseshoe of Luck. However, an unfriendly looking bull blocks your way. You cannot pass it at the moment. So back to the hotel. With the already known procedure (get key, reach door....) you get a branding iron in the shape of a Z from the hotel this time. Go straight on the same way back to the stables. Jump down to the fireplace and put the branding iron onto it. Then jump on the bellows a few times until the branding iron glows. Get the iron and now brand mark the bull with it. After this bold treatment the bull runs away, so you can get hold of the Horseshoe of Luck. With this you can mark also this as done. Back at the spring board you see the Boot of Briskness on the roof of the building. However, you cannot reach it yet, because you cannot jump from the palm tree onto the building. Go back to the hotel instead. There you can now with the usual procedure get hold of a church bell, which you bring into the church and put again into the holder. You do the same with the second church bell, which you also find in the hotel. (Somehow you have to start to ask yourself, who puts all that stuff there …). By this the tomb opens and a ladder gets visible that leads into the catacombs. But do not go down yet. Instead go once back to the hotel and get a trumpet from the room. It is your key to the Boot of Briskness. Stand on the left side of the spring board and then trumpet strongly. An alarmed soldier will fall down and catapult you up. Hold onto the flagpole! Then climb the building and pick up the Boot of Briskness from the roof. With this you have all insignia. Go back to the church and then climb down the ladder at the tomb into the catacombs. Follow the moneybags that mark the correct exit. In no case pick them up! You still need the moneybags so leave them where they are as a marker. I will not go further into the acrobatic exercise you have to do here, this is not part of this solution. Follow the moneybags and eventually you get into a screen in which there is an image of the Chalice, Horseshoe and Boot. If the single components are flashing, the way is free. But first follow the last moneybag to get to the underground lake again. Push the cannon balls into the water and you have created a great shortcut. 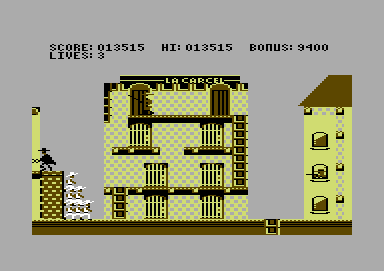 Now go back and climb up the ladder next to the image to get to Garcia's Fort „La Carcel“. The prisoners have formed some stairs, with whose help you can now reach the next section of the fort. Here are two rifle men (one at the top, one at the bottom), who fire in turns. Wait on the ladder until the soldier at the bottom patrols, because a fight would end deadly, if you get shot into the back. As soon as the shot has passed you start running and get onto the middle platform. There you must wait, until there is no solder at the bottom, and jump down and run to the left, after a shot has been released. Here is the prison cell with our Senorita. However, you should not go near her, because she is still shocked! Instead, climb carefully up the ladder until you can hand her her handkerchief. At the moment there is not more possible. So jump to the left over the drawbridge and the moat. To finally get your Senorita out of her state of shock, go back to the hotel. There you can fetch the Rose of Love, which you will need, with the usual procedure. Arrived in the fort, wait until 3 has shot and then run to the stairs. 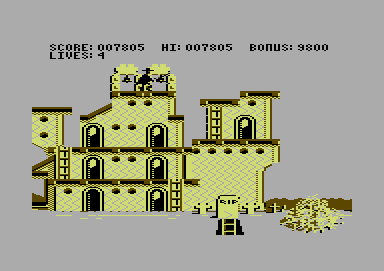 There wait for bullet of man 2 and run up the stairs. Then next screen is crossed as ever, before you are with your Senorita again. Give her the rose. You have survived the adventure felicitously, and Garcia is left empty-handed! Original German text by Joachim Henkel, on his authority. Rockford: "Zorro has in any case its charm. It strengths is the rather funnily released paper chase, otherwise the game would not be worth mentioning. Unfortunately, it offers no motivation to be played again. The game gets from me 6 points, more is denied due to the unfunny and inappropraite catacombs part." Shmendric: "Due to the bad controls the fights are mainly a matter of luck - on the other hand also rather easy. 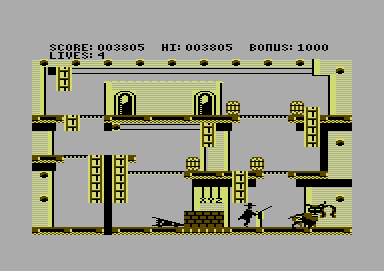 The rapier fights were only built in to spice up the game, indispensable are the puzzles. The music was really ghastly. Zorro cannot stand up the comparison with "Goonies" by any stretch of imagination. The bottom line is that the game is a nice idea, but not well realised." TheRyk: "If(!) 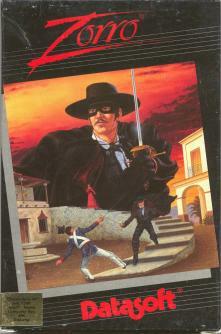 Datasoft ever produced a hit, then it was definetely not Zorro. 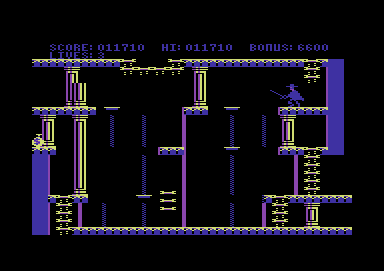 The game shows the company typical 4 color crap (surface: yellow, grey, brown, black, underground: purple, blue, yellow, black, ouch...) and Fitzpatrick managed to contribute some 'music' which is only little less annoying than the game's looks. I wonder what the 'enemies' are doing or if they really do have any AI. It's easy to lose a life when trying the fiddly jumps, but very hard to die in a fight. Stuck in that maze, after tons of boring fights and stupid riddles and forced to fetch the key about three dozen times due to the poor controls to enter the appartment in the hotel (which contains next to all the items), I simply gave up and committed virtual suicide. 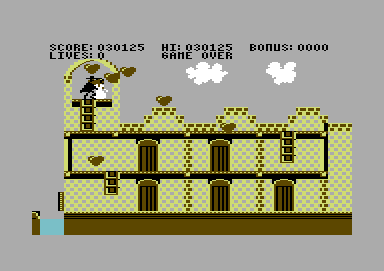 If it has to be Datasoft, I'd rather play 24-7 Goonies than wasting another minute with this terrible trash. I rate this 3 points because the music is a little less awful than in Conan but the controls and gameplay is even worse if anything." This page was last modified on 18 February 2019, at 08:17.